Our Recon Series of Chest Rigs were designed with the Operator in mind. We did away with any excess weight, at the same time giving the end user many additional options. The Recon Series gives the Operator true versatility in mounting additional pouches with the addition of MOLLE/ PALS channels over all surfaces, giving more configuring options. There are added elastic loops for the stowing of communications cables and hydration tube routing. Also included is a 215 Gear Tourniquet Holder mounted under the magazines. We also countered the biggest complaint of most chest rigs on the market- donning and doffing. Our unique design, based on the H-harness, allows the Operator to self adjust the rig snug against the body by himself, via self adjusting straps. 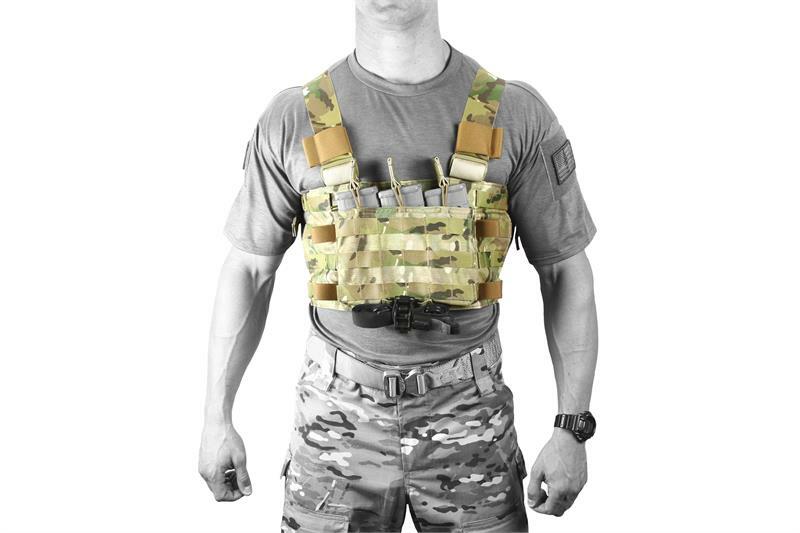 Gone are the days of needing a hand to get your chest rig over your armor carrier. The rig carries a recon load of three 5.56 magazines securely held in place with an adjustable bungee system. Made with all high quality Mil-Spec materials. Product total weight 1 lbs.